Whilst sitting peacefully enjoying an invigorating cup of Wild Alaska Chaga Tea, a question drifted across our minds like the mournful howl of a lone arctic wolf. How can we complement to the subtle woodsy flavor of the chaga mushroom? The answer hit us suddenly like fifty pounds of wet snow sliding off the tin roof of a log cabin. 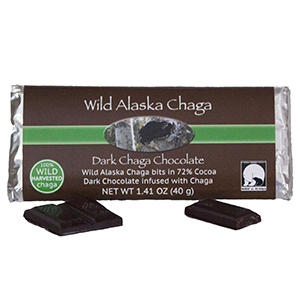 Chaga’s perfect companion could be nothing other than a rich dark chocolate! Made with a wild harvested Alaska chaga infusion, chaga bits, and shade grown organic cocoa beans, as you break off a piece of our perfectly formed chocolate bars and let its dark mystery slowly engulf your flavor buds you will gain an inkling of the magical complexity to be found in the frosty forests of the north. Finally, a chaga treat you can eat! Soy lecithin free.